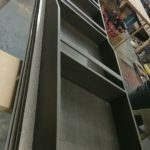 Bespoke upholstery is the work of producing a unique piece of furniture using padding, springs, webbing and a cover of fabric that is tailored to specific requirements. 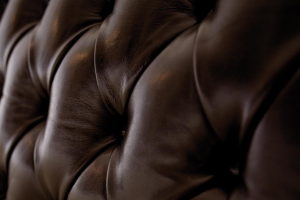 We upholster sofas, chairs, stools, headboards, foot rests and anything else you can imagine. Bed upholstered by Dalbergia for And So To Bed. Why is bespoke furniture worth the investment? There’s times when taking actions to reach the perfect family home or a high quality personal space is essential. 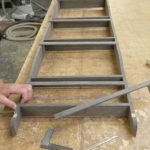 A bespoke piece of furniture is not only made to look amazing, the process also takes into consideration what it will be used for and and who is going to be using it. You may want a piece of furniture that is created mainly for a visual purpose with the aim of making a statement in your chosen room, or maybe you want something incredibly comfy and able to accommodate children and pets. The choices are endless with bespoke furniture as we can upholster exactly what you have in mind to fit the theme, ambience and needs of your home. The design process, gathering inspiration and watching the progress of your bespoke piece is an exciting journey. Dalbergia offer a personal service that involves a home visit and as many discussions as you need to reach the furniture you’re content with. 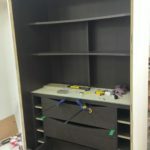 The process allows you to put all your inspiration and ideas into a physical piece of furniture, but if you’re not completely sure what you want we will help and advise you on what will work best in your situation. Your home is a place of happiness and relaxation so we understand how important it is to get it right. 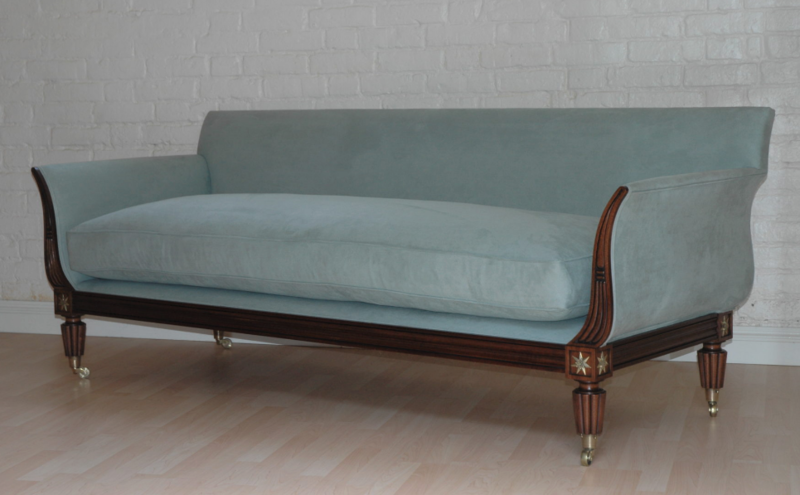 Our bespoke furniture is of much higher quality than furniture bought on the high-street. You could look at bespoke furniture as an investment for your home as the furniture can be treasured for generations to come. Whether it is to fill an awkward space or create the perfect family area, our experienced craftsmen and high-tech machinery will ensure your furniture is long lasting. Bespoke sofas start from £2800 plus fabric and VAT. 1. Firstly, you need an idea of what you want, where it will be and what you want it to look like. Gathering inspiration from the rest of your house, the internet or decor magazines is a great way to help you come up with an idea. 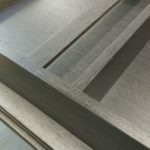 Coming to us knowing what you want or with some idea is a great help, but if not we are excellent at designing and suggesting the best size, material and finish for your piece of furniture. 2. Secondly, we will advise you on measurements to ensure the furniture will fit your chosen space how you would like. 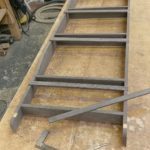 We will use photos taken of the area to show our craftsmen in the workshop so they can get an idea of where the furniture will be going and the personality of the room. 3. After deciding on your furniture our employees will use computer aided design to create a virtual image of the piece. Further discussions with you will result in alterations of the details, design and measurements if needed. 4. Once these stages have been completed, the production of your furniture will begin. This starts with the frame which will be created either by hand or by our CNC machine and then glued together. 5. The inside of your furniture is equally as important as the exterior of your furniture. If you will be using your chair or sofa a lot you will want it to be as comfy as possible and ensure it never loses its bounce. The inside of your upholstered piece may consist of springs and stuffing. Stuffing options vary and will depend on your requirements. It can be felts or superior high density foam which is available in many different thicknesses depending on your comfort needs. Or, you may choose a more traditional stuffing, such as horse hair. Either way we will advise you on the most suitable filling for your type of furniture and situation. 6. Next, your chosen fabric will be applied to the furniture. When choosing you fabric its again important to consider how you live and who will be using it. In a family home you’ll probably want a more durable fabric that is not easily stained. However, if there no children or pets present you can select a more delicate, lightly coloured fabric. Our upholstery department are brilliant at pattern matching and take great care with the finishing trim to ensure it is neat and tidy. Bespoke headboards are a lovely investment for your home which you could have fluted or plain with stitching details. You may also choose to have it fitted to your wall. Below is a deep buttoned headboard we upholstered as part of a Bonaparte bed for And So To Bed. Headboard prices start at £350 plus fabric and VAT. 7. If needed, we will produce cushions to go with your piece of furniture. We want them to be the highest of quality so you can chose whether you want these to be feather or foam. The range of feathers we offer include; poultry, goose and duck. All pillows or cushions are also pocketed which means sections are sewn inside to ensure the feathers don’t move and make the cushion lumpy or uncomfortable. 9. Finally, it’s time for you to enjoy your new furniture! Put your feet up and enjoy the new space made especially for you. 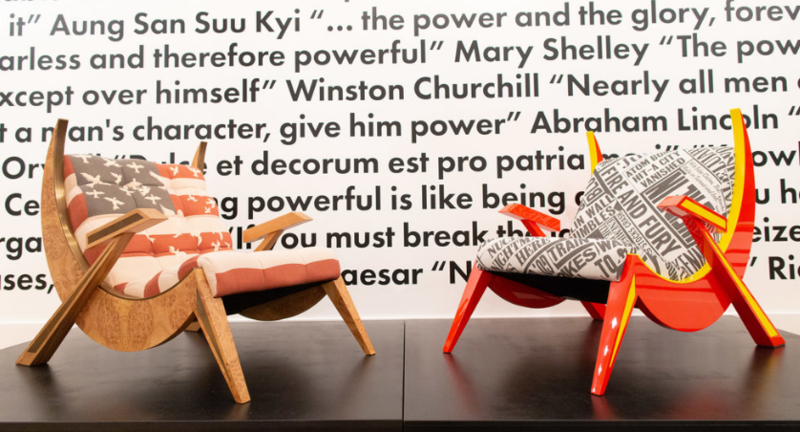 Dalbergia developed the upholstery design and made the sprung seat and back for these chairs by Luke Irwin and Little Halstock. With 13 wardrobes and 10 kitchens and utilities as well as wall panelling and bathroom vanity units to design, make and install in central London we are going to be busy over the next few months. The project involves matched veneers in oak and ash with panelling merging into kitchen and wardrobe doors. We will try to post some photos of the works as they progress through the workshop. We are making a new kitchen for a client in Bromley. It was difficult to narrow down the material choices but we got there in the end. We used Tabu veneer Lati in combination with a silky smooth lacquer finish. The Lati is being used used to make a particularly nice larder cupboard with shelving, drawers and spice rack. See some workshop images below. We will post images of the kitchen when it is completed. Dalbergia win contract to supply furniture for the Crown Estate in central London. 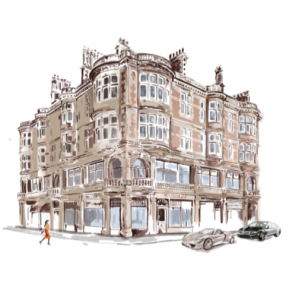 Through the main building contractor Dalbergia have been awarded a contract to supply in the region of 70 items of new furniture for a development of 6 apartments in a listed building in central London. We will be working with leading interiors designers Morpheus to bring their designs to fruition. Each apartment contains vanity units, mirrors, wardrobes, entrance cabinets and headboards. We will need to develop the designs so they are ready for construction. There are bespoke bronzed handles and hardware to integrate, extensive veneers to ensure consistency of colour and grain and matching as well as quality fabrics to work with. 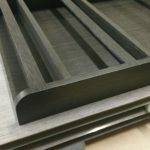 The project has a very tight deadline so a great deal of organisation will be required to ensure production in the workshop matches our fitter’s requirements on site. The contract involves the careful removal from the Joseph Hutong gallery of 165 mahogany showcase doors. The job involves extensive renovations to the existing doors and also making matching doors and radiator panels from new. 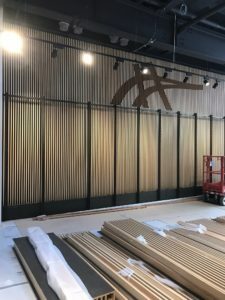 We will need to work with our metalworking subcontractor to design build and fit metal reinforcement to the doors so they can take new showcase glass, locks and seals. Not an easy task considering these doors are over 100 years old. Our contract is with the main building contractor but we are delighted to be associated with such a prestigious client. We will keep you updated with the job progress. Dalbergia win contract to supply joinery for Asics flagship store on Oxford St. 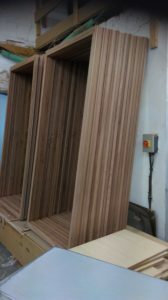 Requiring large many panels of solid maple slats in a very short turnaround we will be able to use our 3d design and CNC capability to ensure everything fits together for the shop fitter on site. We are also supplying solid maple stair treads and maple balustrade. The job is progressing well and below is an image of one large wall which was sent up as individual panels with the Asics logo routed in. This was achieved using our 3d modelling capability in conjunction with our CNC.